Are you ready to take a trip back to the 90s??? I have so many fond memories from high school and college tied into their songs I can't help but be filled with an enormous wave of pure good vibes nostalgia when I hear their hits on the radio. I'm such a fan of all of them that I even scoured shops looking for first press vinyls of their singles. It's such a rewarding feeling to have a piece of history in your hands. To say that I am excited for this concert is an understatement. 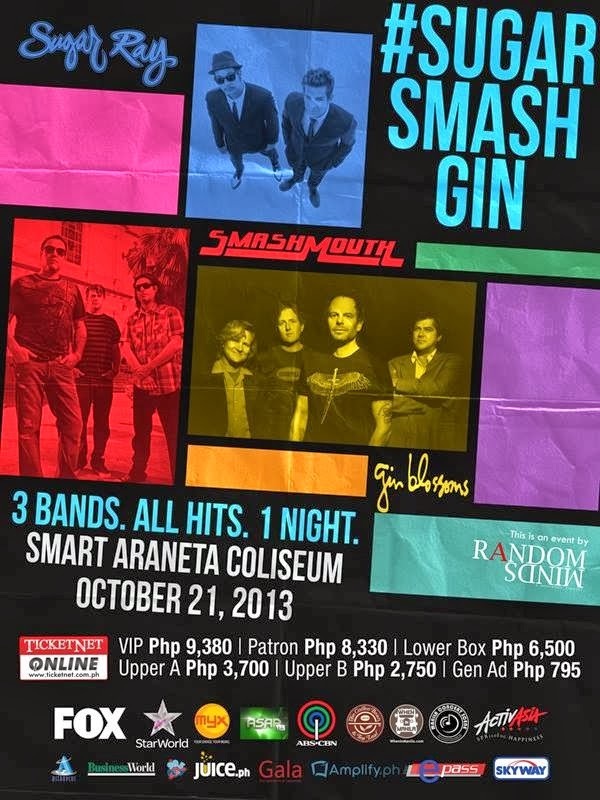 This is THE concert of the year and I can't wait for the 21st of October when Gin Blossoms, Sugar Ray, and Smashmouth come together in one rare occasion to play all their hits at the Araneta!!! Playlist for the night include Smashbox's hits: I'm A Believer, All Star and Can't Get Enough Of You Baby. While forever high school/college crush Mark McGrath performs Fly, Someday, and Every Morning live with the rest of Sugar Ray. And finally, my ultimate fave: Gin Blossoms!!! Sing along to Hey Jealousy, As Long As It Matters, Follow You Down and many, many more!!!! This is definitely one concert you shouldn't miss. The odds of this happening again are close to none. Get your tickets today before they run out! Tickets are now available via www.ticketnet.com.ph or call 911 5555.